In the event that your child -- a parent to your grandchild -- passes away, and the surviving parent takes full custody and denies or limits your visits with the child, you may be able to file for grandparents rights. In this situation, you would need to prove that you maintained a relationship with the grandchild prior to the parent's death; you were a caregiver for the child, or the child lived with you in the year prior to the death; and that dissolving the relationship with your grandchild would not be in the best interest of the child. If your child is in the process of divorcing his or her spouse, you may be able to file a motion in the proceedings to get temporary or permanent visitation rights during and after the divorce. Because your grandchild's time will now be split between two parents, the time you will get to spend with them will decrease, and this is something that you should be aware of and accept. To file for grandparents rights and get visitation in this situation, you will need to demonstrate that you have an extensive relationship with the child and have spent a significant amount of time with him or her prior to the divorce. You likely won't get much more than a weekend or two a month, because most of the child's time should be divided between the parents, especially when the grandchild is still learning to adapt to their parents no longer being together. Time will likely be taken away from the custodial parent, so make sure you aren't trying to interfere with the visitation schedule of the other parent. File a Motion to Intervene in the parents' divorce case. You can do this by calling the courthouse where the divorce was filed and getting the docket number and case information so that you can file your motion correctly. The motion will then be heard by a judge, and one or both parents may be present at the hearing to either contest or support the motion. You will need to bring evidence to back up your motion to demonstrate that you have established a relationship with your grandchild, and terminating that relationship would not be in the child's best interest. File a Petition for Grandparent Visitation if a parent has passed away. A petition is very similar to a complaint, which initiates a lawsuit. The difference between a complaint and a petition is that a complaint seeks to compensate the filing party for damages of some sort, while a petition seeks to force someone to do something or stop doing something. In this case, you want to force the parents to allow you visitation rights with the child. The case will then continue the same way a normal court case would, with a discovery phase where either party can request documents for evidence, and a court date where both parties will appear in front of the judge to argue their sides of the matter. Come to court prepared. Bring any evidence you have to show that you had a prior relationship with the grandchild and that cutting off that relationship is not in the child's best interest. Show that the parents are being spiteful or unreasonable by cutting off communication between you and the child. If the judge agrees with your side of the story, a visitation schedule will be put into place. Contributor. 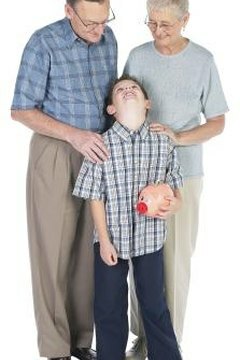 "How to File for Grandparents Rights." , https://legalbeagle.com/5140502-file-grandparents-rights.html. Accessed 24 April 2019.